This artist's rendering shows a dwarf star and its planets. Some planets around these kinds of stars might seem habitable, but they're really "mirage planets." 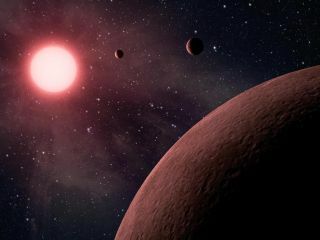 Some alien worlds might look like they're capable of hosting life as we know it on Earth, but in reality, these "mirage planets" might have burned away those chances for life, scientists think. Thus, these mirage planets may make it more difficult for scientists to find genuine signs of extraterrestrial life if it exists elsewhere in the universe, new research shows. The search for extraterrestrial life often focuses on red dwarfs, also known as M dwarf stars, which are the most common type of star in the universe. Red dwarfs are up to 50 times dimmer than the sun, which means their habitable zones are much closer than Earth is to the sun. Now, computer simulations have revealed that some planets around red dwarf stars may have had all of their water burned away in their youth but still look as though they might be inhabited by life. Stars form when giant clouds of interstellar gas collapse. Because red dwarfs have low masses and, therefore, weaker gravitational fields, they take longer to fully collapse than stars like the sun, "on the order of many hundreds of millions of years," said lead study author Rodrigo Luger, an astrobiologist at the University of Washington in Seattle. In their early years, red dwarfs can be tens, or even hundreds, of times brighter than they are later in their lives. "Planets around these stars can form within 10 million years, so they are around when the stars are still extremely bright," Luger said. "And that's not good for habitability, since these planets are going to initially be very hot, with surface temperatures in excess of 1,000 degrees Celsius [1,832 degrees Fahrenheit]. When this happens, your oceans boil and your entire atmosphere becomes steam." At the same time, although red dwarfs become dim, much of the light they do emit comes in the form of ultraviolet light and X-rays. This high-energy radiation can split up water into its component hydrogen and oxygen atoms. The lighter hydrogen escapes the atmosphere more easily, leaving the heavier oxygen atoms behind. This effect can lead to atmospheres with "many thousands of times more oxygen than that in Earth's atmosphere," Luger told Space.com. These findings suggest that even if a distant planet is too dry to host life as it is known on Earth, it may possess a great deal of oxygen — "so much that you'd expect it to be detectable, potentially confounding our search for life on these planets, since oxygen is usually thought of as a tracer of life," Luger said. As such, these worlds may essentially be "mirage planets." "Because of the oxygen they build up, they could look a lot like Earth from afar, but if you look more closely, you'll find that they're really a mirage — there's just no water there," Luger added. "So, not only are these planets uninhabitable, but they can actually trick us into thinking they're inhabited." The scientists noted that, although the processes they discussed "threaten the habitability of planets around low-mass stars, it certainly does not rule it out," Luger said. "There's just so much we don't understand about habitability and the origin of life that it would be premature to draw any strong conclusions." Still, Luger said the study is "a cautionary tale." "Terrestrial planet evolution around low-mass stars is very different," he said, "and we need to keep that in mind when trying to assess a given planet's potential for hosting life." Future research can aim to confirm these findings by looking for oxygen on exoplanets in the habitable zones of distant stars. However, this will have to wait "at least until the James Webb Space Telescope is launched in a few years," Luger said. "But may take even longer," he added. "It's just a really hard observation to make." Luger and his colleague Rory Barnes will detail their findings in the February issue of the journal Astrobiology.